What effects pedals with your rhodes? I'm curious what effects (boosters, preamps, chorus, phasers etc etc) pedals you guys are using with your rhodes? Re: What effects pedals with your rhodes? MXR Phase 90 script through a Fender Princeton Chorus stereo amp is what I found works best for me. Although I really like the “naked” rhodes sound, these are my pedals in order of use (for clavinet or wurlitzer the order would be different). RE-201 Space Echo – Beautiful!!! Sometimes I run FunkBox from my iPhone through it for practicing to give it a more organic tone. Almost anything sounds good through this. Crybaby Wah – I use it either as a filter or wah-wah-wah. So far, I like Crybaby the best. Fulltone OCD Overdrive – I tend to use this in place of the M108 lately as I like a little overdrive every now and then. Dunlop JH-F1 Jimi Hendrix Fuzz Face – Nice fuzz used crazy or sparingly. MXR M108 10 Band Graphic EQ – Super handy box for giving a little boost, shaping the tone, or getting ride of noise. MXR M107 Phase 100 – I bought this super cheap and have really not used it. Perhaps I am just not a phaser guy? I hear the vintage ones are much nicer. MXR M134 Stereo Chorus – I do not use a lot of chorus in my playing, but when I do, this is what I use. Vintage Fender Fuzz Wah – I am not sure about this pedal. The ergonomics are cool but the fuzz and wah seem lacking. Budda BudWah Wah Pedal – A little too smooth for me. Boss RC-20 XL Loop Station – For when I am playing all alone at home and need more than 2 hands. Dunlop Cry Baby from the '70s, EHX Deluxe Memory Boy, Moogerfooger MURF. Sometimes a Boss RT-20 Rotary speaker emulator, set on slow, in stereo. Can't believe no one mentioned the Univibe! Old ones are hard to come by, but Fultone makes a very nice replica. I've tested some actual multieffect pedals and I like the Korg Pandora Mini. 200 preset (for guitar and bass) and 200 user editable patches. Test it if you can. 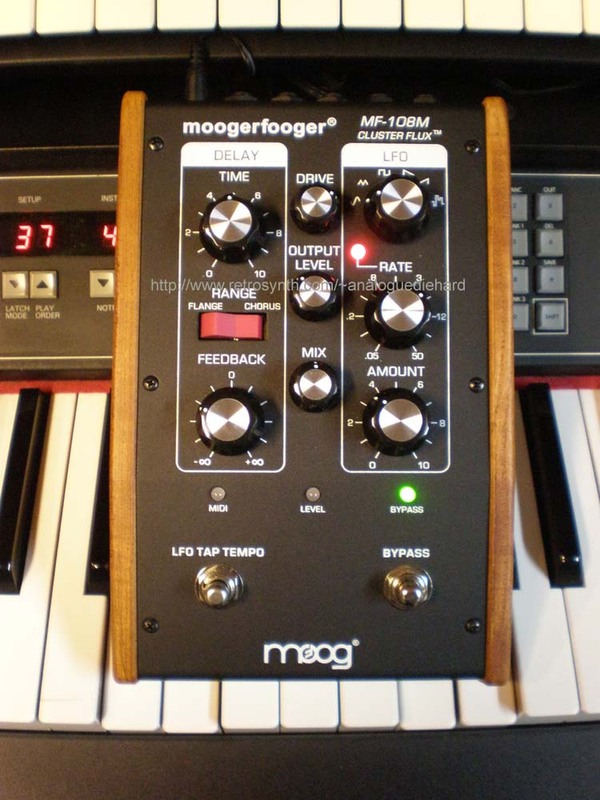 I'm using a mid-70s Maestro Stage Phase which was reportedly designed by Bob Moog. It's the one with the huge roller wheels for easy adjustment with your feet. I like it because it has two presets as well as variable speed and depth controls, but also ramps up and down like a Leslie as you switch between speeds or shut it off. It may be a bit noisy for some, as it's designed for guitar and doesn't have true bypass. In addition, you can hook up to two separate amps for even wider dispersion. Here's a youtube vid of a guitar demo, but you get the idea. The phaser is remake with tweaks (depth knob instead of color switch among other things) of an old 70's Electra which was just a rebrand of an Electro-Harmonix Small Stone. 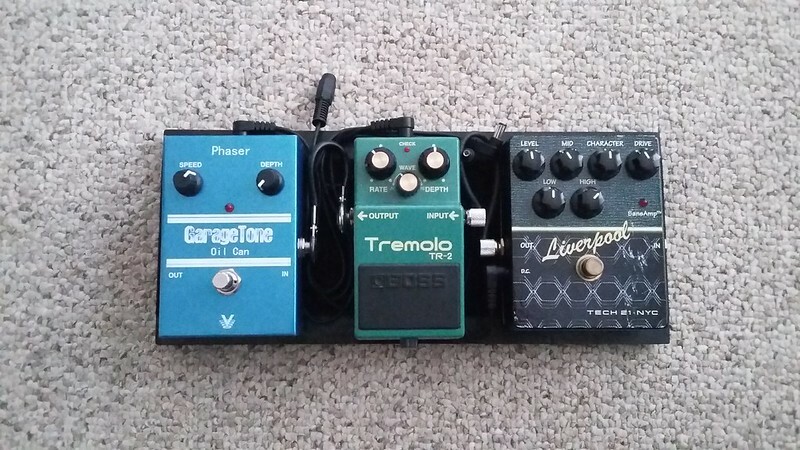 Initially when I set up the effects I had the Phaser > Trem > Liverpool but I got amazing amounts of hiss. I tried a couple different orders of the effects and putting the "preamp" first lowered the noise considerably. I used to use a phasor, but it sounds so 70s, and I really don't like it any more. A bit a tremolo can sound nice. I tried a true vibrato pedal , but somehow vibrato sounds much better on a Hammond than a Rhodes IMO. Most of the time I just try to get the best natural Rhodes sound I possibly can. To some extent, that's a never ending quest, but I'm making progress. Next, I'm going to try a buffer/boost circuit of my own design that mounts in the piano, under the hood. If it works well, I'll post some info on it. Boss BluesDriver: Not as an overdrive, but as a clean / solo boost and making the signal a bit more cutting and 'gritty' when on. George Dennis GD-30 Wah: Optical wah which sounds not so 'peaking', noisy and bass-cutting than a CryBaby, but no so bland than a Morley.